Independence Day is fast approaching, and the excitement is starting to build up. 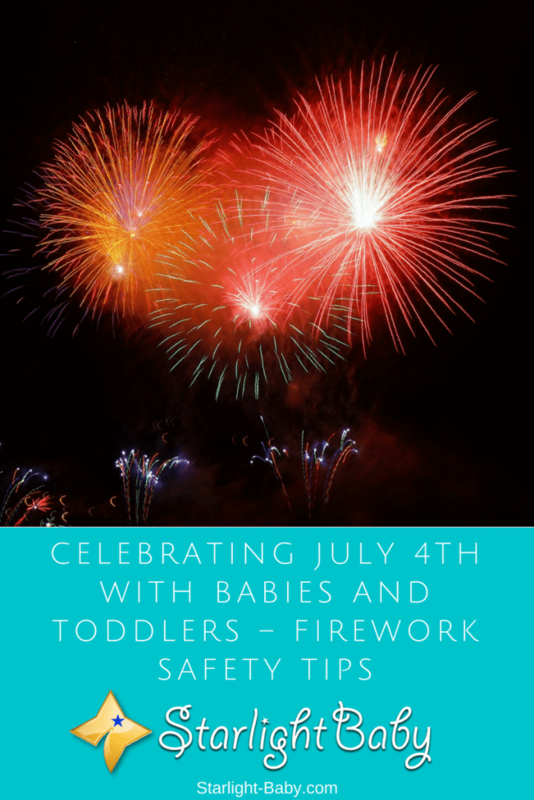 However, if you’re looking to celebrate in style this July 4th, it’s imperative you familiarize yourself with a few health and safety tips to keep you and your little one’s safe. The American Academy of Pediatrics for example, has frequently warned of the dangers of buying fireworks to set off at home. Each year thousands of people injure themselves or their baby/toddler due to improper use of consumer fireworks. So, before you start celebrating this year, below you’ll discover the best tips and advice to ensure you and the family can enjoy a happy, safe July 4th. You probably already know to keep your baby or toddler far enough away from fireworks to keep them safe. However, it’s not just the potential physical dangers which make this advice so important. Viewing fireworks too close can be quite scary for little ones. The bright lights, combined with the noise of fireworks, can terrify babies and toddlers. This in turn could lead to problems later on in life, where they start to fear loud noises. So, to avoid this it’s worth finding a spot at least a mile away where you’ll still be able to view the fireworks as they go off, and leave if they seem visibly shaken up and terrified. It may sound a little too safe, and of course it’s down to each parent’s personal preference. However, viewing the fireworks from quite a distance will guarantee your little one doesn’t become too fearful of the sights and sounds of the fireworks. There’s also the added bonus that being a little further away means there will be fewer crowds and traffic to worry about. Toddlers are inquisitive and they love to get involved. However, if you do insist on having your own at-home firework display, it’s vital you keep your toddler far away from the fireworks, even when they aren’t lit. This also includes popular sparklers. Often considered as harmless, sparklers can cause significant burns and toddlers are definitely too young to be in control of them. Did you know that they actually burn at 2,000 degrees? According to experts, this is the exact same strength as a blowtorch. So, ask yourself – would you let your child play with a blow torch? A good alternative to keep your toddler happy, is to invest in glow-in-the-dark bracelets or glow sticks. These are 100% safe and still provide the fun factor. While many parents host their own July 4th firework displays with no nasty incidents, the risk is always higher than going to an actual display. Therefore, the American Academy of Pediatrics does advise against having your own display. Fireworks aren’t typically loud enough to damage baby’s hearing, but it is still a possibility. More importantly however, is that your baby’s and even your toddler’s ears are a lot more sensitive than ours, which means they can get really scared hearing the sudden loud noises. If you are off to a firework display and you won’t be too far away from the fireworks, it’s worth investing in Starlight Baby’s ear protection kit, which includes high quality earmuffs, earplugs, and a convenient carrying case to keep their ears protected. If they can’t hear the loud bangs as much, they’ll focus instead on the pretty lights. All of these are safe and effective to use. If you’re still concerned however, you could always watch the firework display from the comfort of your car. Before heading out to a firework display, it’s a good idea to do your research. Going anywhere with a baby or toddler can be a challenge in itself, so it really helps to go with a proper plan in place. Make sure you look at where the entrance, fireworks and toilets are going to be. Make a list of everything you’ll want to take with you and plan for every eventuality. Take extra clothes, diapers, food and absolutely anything your baby or toddler might need. If you go prepared, any potential hazard or incident that crops up will be a lot less stressful. This one might seem obvious, but it’s surprisingly easy to lose track of a toddler in a busy place. July 4th firework displays can get really crowded, so rather than simply holding your toddler’s hand, you may consider keeping them on a specialized toddler harness. That way, they won’t be able to escape very easily and you can ensure they are far enough away from the fire and fireworks. Fireworks can leave behind a lot of debris – something toddlers can find fascinating. If they see it, they’re guaranteed to pick it up! It may seem harmless, but firework debris can be extremely dangerous. It could still explode and it could also be really hot after being lit. If your toddler is old enough, it’s also a good idea to teach them a little about firework safety before the celebrations begin. You can do this in the form of a song or a story if you want to achieve the best results. If it’s fun, your little one is more likely to remember what you’ve told them and they’ll want to follow the rules of the song or story too. Surprisingly, the main thing parents struggle with on July 4th isn’t the actual fireworks. As the majority of firework displays start at night time, the biggest problem comes from a disrupted bedtime. Whether you have a baby or toddler, any change to their bedtime can result in serious problems. It’s recommended you let them have an extra nap during the day, or not long before the firework display, to ensure they don’t become extra cranky. You should also be prepared for meltdowns both on the day and in the days following July 4th. You’ll also want to take healthy snacks and drinks along with you. Just like adults, babies and toddlers get hungry and any change in their mealtimes is going to result in potential tantrums. Ensuring they are satisfied while you’re out at a display will help to maximize the enjoyment. Finally, it’s a good idea to have a backup plan. Some babies and toddlers absolutely love firework displays, while others get traumatized by them. If your little one isn’t happy and is visibly upset by the display, you’ll need a backup plan. Overall, it’s important you follow the above firework safety tips if you want you and your little one to enjoy the July 4th celebrations. It can be a fantastic experience provided you’re watching them from a safe distance. Most importantly – never let your toddler go anywhere near fireworks, regardless of whether they’ve been lit or not. I think having her watch them from a safe distance is the best I can do, because she sees all of the beautiful sparkly colors without the deafening sound or the ever-dangerous fire. Thank you very much for writing this! It’s very important to keep an eye on our toddlers in this season, and this wonderful advice is something every mom and dad should read. Yeah, I agree with Roselady. I think just letting them observe the fireworks from a safe distance is the best option when they aren’t newborns anymore. It makes them feel special and like they’re a big part of it. Every year, I explain the fireworks to him just to make sure that he remembers how it works. I tell him the dangers surrounding it if not set properly and that there are safety regulations we all must follow – that includes him. He always has to promise to behave when we go to the fireworks event. We can’t really leave him at home with a babysitter because he just loves them and gets so excited. I guess it’s the colors and the weird shapes that the fireworks produce that attracts the kids so much. I really love 4th of the July and so does my boy. He always screams ”mummy look at that one! !” It is so adorable. So, thank you for all of the wonderful tips and for making sure that us parents don’t forget how important safety is. Vigilance as you say is the most important key to avoiding any mishaps and ofcourse not giving into their whims. Kids can be quite stubborn at times. .
yes always let them watch the fireworks from a safe distance , safety is so important . As a rule in my home, we do not buy firecrackers and things that can set off or potentially start a fire. If we have a guest over and they would like to participate in this activity, we explain they are more than welcome to do so but outside the house. No fire appendages is allowed in the house. Fire accidents are terrifying and the risks involved with firecrackers where little babies are concerned is just too high. This especially helps as my partner works out of state sometimes and I am alone with the kids. I would rather not take the chance and not make any purchase at all, than trying to manage or avoid a potential crisis. Since I am not an American and I don’t live in the United States, I don’t celebrate 4th of July. However, in a month from now, there will be Diwali, a Hindu festival, when there will be a lot of fireworks. When Diwali comes, my baby will be five months old. Since the baby already loves to watch the colors displayed on TV or mobile handsets, I think he will also love fireworks. I understand fireworks pose a great danger for babies and toddlers. I believe these tips will come handy when we are having fireworks during the Diwali. These are really good points on how protect ones kids/toddlers from the dangers or hazards of fireworks. We all aware how independence day could get in terms of celebration and fireworks, it’s definitely crucial that parents be vigilant of how their kids play around on such day. Some fireworks has the tendency of actually giving even an adult a high degree of burns, so you can imagine what I could do to a toddler’s skin. It’s very paramount that parents keeps their kids far away for fireworks. Prevention is always better than cure. Am not an american and though we celebrate our independence here too in a similar way to that of the U.S.A, i’ve always envied the way 4th july gets to be celebrated. The fireworks are just too amazing. A parent can never be too careful when it comes to kids and fire works. I think your tips are some very good recommendations on safety of kids around fireworks celebration like that of july 4th. I’ve seen so many injuries on kids resulting from negligience play around fireworks and knockouts. I hope every parent and adult reading this post will put those tips into consideration.